This layered curried rice and raisins recipe will make a family-sized side dish for pork or chicken. Add it to your repertoire of Gift-in-a-Jar recipes for great homemade gift giving. Place 3/4 cup of rice in a one pint (or two-cup) jar, and then add separate layers of chicken bouillon powder, dried onion, curry powder and raisins. Pack the raisins down with a spoon and top with the remaining rice. Note: If the jar isn’t quite full, add a little more rice to bring the jar mix to the top of the jar. If you leave a space, the ingredients will shift and you’ll lose the layered look. 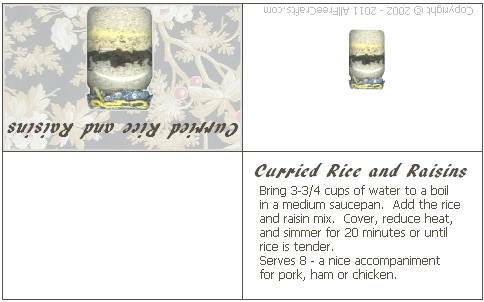 Print and attach the Curried Rice jar label to provide the recipient with instructions on how to best use your gift. You can fold the label into quarters, so a picture and recipe title appear on the front, with directions on the inside. Or you could cut the out the jar of curried rice picture and glue it to the front of your jar, with the directions cut out and pasted on the back. Bring 3-3/4 cups of water to a boil in a medium saucepan. Add the rice and raisin mix. Cover, reduce heat, and simmer for 20 minutes or until rice is tender. Serves 8 and makes a nice accompaniment to pork or chicken dishes.